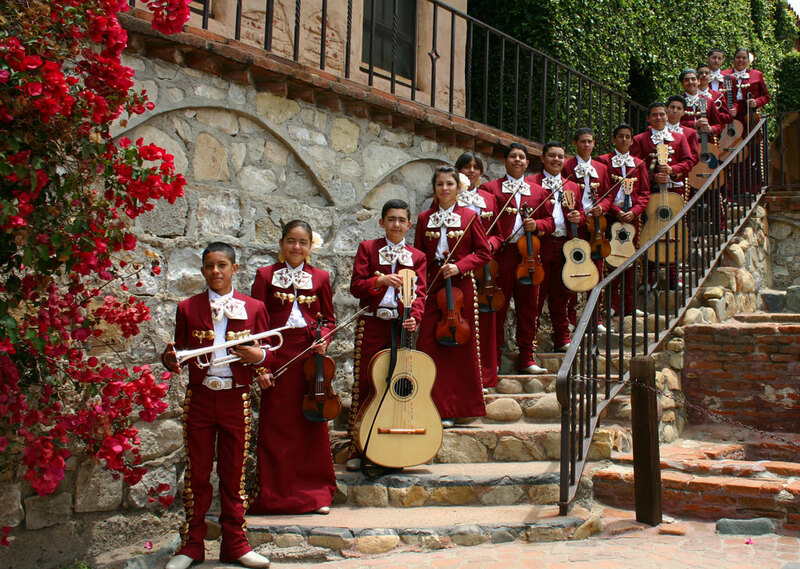 The Sinfonia Mexicana of San Bernardino established the Mariachi Youth Academy in February 2009 at the Sturges Center for the Fine Arts as an opportunity for area youth to learn and perform mariachi music as well as understand its origins and cultural significance. The Mariachi Youth Academy’s Mission – Is to establish a continuing and comprehensive course of study that will challenge and enhance the student’s ability to read music, master their instruments and enhance stage presence through the art of performing mariachi music. Our Goal – Is to prepare and encourage academy students to further their musical education. The program instills responsibility, discipline and stresses the advantages of higher education. The Academy currently has forty-seven students that attend middle and high schools from San Bernardino, Rialto, Fontana, Bloomington, Riverside, Oak Hills, Phelan and Hesperia. Classes are currently being taught for intermediate and advanced students with plans for beginner classes very soon. With world-class musicians/instructors guiding the program, the Mariachi Youth Academy is poised to be a nationally recognized learning institution for the advancement and promotion of the art of mariachi music and performance. We invite you to come see and hear these talented students and discover the opportunity to help these youth reach beyond their potential and support their dreams and ambitions through the "Adopt a Mariachi Student" program. The Sinfonia Mariachi Youth Academy was established in February 2009 and one of its goals is to “challenge and enhance the student’s musical ability” by teaching students to read music and musical theory. Mariachi music is inherently taught by learning how to play by ear with little, if any, emphasis in learning music theory and how to read music. The significance of learning these skills is to allow students to expand their musical knowledge beyond mariachi. These skills will also be helpful in opening doors in furthering their education. To many of these students, learning to read music has been a difficult challenge. Academy instructors Cindy Shea, Alberto “Beto” Jimenez Maeda and Martin Barboza-Zarate have extensive knowledge and degrees in music. These instructors have been teaching students by using various methods to successfully overcome these musical/educational challenges. I believe the Mariachi Youth Academy is accomplishing its goals of educating, building confidence, discipline and responsibility to these students. With these core values, these students will have no limits to what they can achieve. A beginner’s class of 31 students, ages 8 through 12, was started on March 1, 2011. Instruction includes the basics of music theory. Instruments will be introduced at a later time. Instruction for intermediate and advance Academy students continues. Students have also been practicing their music, singing and stage presence/performance. On March 13, 2011, the Mariachi Youth Academy, with the Symphonie Jeunesse Orchestra, was the featured artist at the “Stars of Tomorrow” performance at the Sturges Center for the Fine Arts. The San Bernardino Valley Concert Association sponsored the event. We extend “un gran abrazo” to our sponsors and Board members for recognizing the dedication and accomplishments of these students and instructors and allowing this wonderful program to continue.